The awardees of Sri Sarada Math-Rasik Bhita and All Bengal Women's Union Children's Welfare Home went to Bishinda Hills in Bankura District on 27th December, 2014 to take part in their Adventurous Journey as part of the Gender Diversity Empowerment Project. There were 64 awardees from remote villages like Baladbandh (in Hooghly District), Kumrogori (Near Singur in Hooghly District), Howrah etc with three Award Leaders. Among them were 43 Bronze awardees and 21 Gold awardees. It was the first time away from home for the Bronze awardees, especially for those who belong to the remote villages, as they participated in the Adventurous Journey. 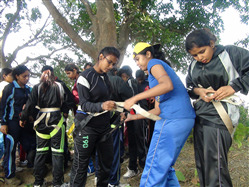 It was a wonderful opportunity for the Gold awardees as they were exposed to various leadership-building activities. Besides that it was another golden opportunity for the Bronze awardees to take part in different activities like tent and tent life, Jumering, trekking, Burma bridge crossing, river crossing, rope obstacle practice, as well as cooking. The girls of Baladbandh, Singur had never thought that they could stay four nights away from home. One of them expressed her feelings at the camp fire on last day of our adventurous journey, saying that she had learnt a number of things from the training. The journey ended on 31st December, 2014. While returning home all the young faces looked so confident and all the awardees were brimming with happiness. It was the last day of 2014, and the participants expressed their hopes of making a new beginning, a new journey for those girls who started to feel 'Yes! We can!' after the wonderful training of Bishinda Camp. The NAA wishes to thank Adrija Chatterjee (Indian Youth Representative), Institute of Climbers & Nature Lovers, Kolkata, Md. Imran and Satrupa (both Gold Award Holders) for their guidance and help in the successful completion of the camp. More pictures of this journey can be seen here.